A A growing number of Institutional investors are entering the Digital Assets space, supported by high profile players looking into this new asset class. According to Bloomberg, George Soros and the Rockefeller family’s Venture Capital fund are beginning to take positions in the emerging asset class. While the average fund size remains relatively small compared to that of the traditional financial world, in 2018 the total number of crypto funds grew significantly. As of today, only a few players are solely focusing on this new asset class (10% of total funds have 100% of AuM in Digital Assets), but many traditional asset managers are investing in Digital Assets up to 25% of their total AuMs. Wide-spread insurance coverage on custody solutions, with insurance providers starting to open their business to a greater audience. Regulations supporting Digital Assets (especially for Europe) and the eventual acceptance of blockchain-based assets. Combined with the increased recognition of security tokens, will ultimately professionalize the entire ecosystem. Our research shows that, for 2018, the average fund size investing in Digital Assets is still (relatively) small when compared to traditional assets. The majority of these funds hold between $1–25 mn of total AuM, and the most common exposure to Digital Assets is between 50–70% of total AuMs. When looking at bigger funds (up to $250mn in AuM) the situation is split into two camps: either exposure is limited (<25% of AuMs) or it represents the major asset class held in the portfolio (>50%). “Pure crypto funds”, those with 100% of AuM in Digital Assets, are still very small, making up just $1–$25mn in total fund size. When it comes to trading — 35% of funds trade purely on exchanges . Custody preferences are finally moving towards more optimal and efficient solutions . This is mainly due to new emerging players entering in the market with more sophisticated solutions, but still a substantial part of funds and investors keep “buying internal risk”. 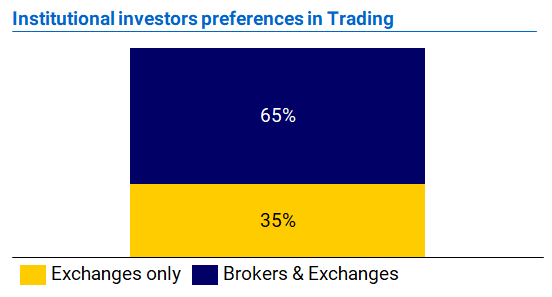 In fact, 38% of fund managers still rely on self-custody and ~8% of funds managers prefer to leave their assets on exchanges. As previously described, professional investors are no longer relying primarily on cold storage. The majority of funds using third-party providers greatly prefer “mixed-solutions” (e.g. 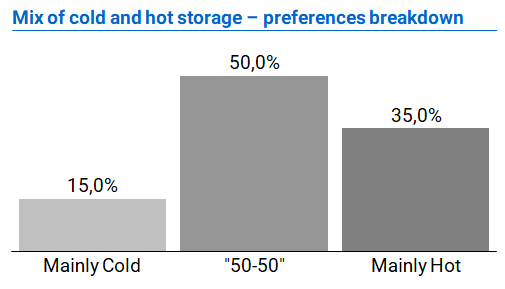 hot and cold storage based on hardware Security Modules), and when it comes to distribution preferences, only 15% of them prefer to have cold storage as the primary solution. Increasing competition is driving prices down, getting closer to the traditional custody pricing fees. However, 20% of funds managers still pay 70–100bps while the majority is paying 40–50bps. No fund reported paying less than 40bps for Institutional Custody services. 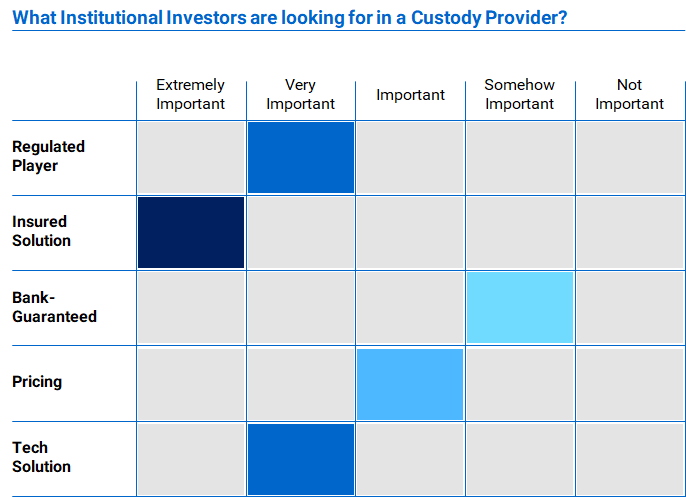 In summary, building the optimal Custody service for professional investors requires a combination of different factors, from insurance, to regulation, and to technology solution. As shown in the chart above, if we compare Institutional Investor’s preferences against current state of the industry offering, we can notice that still many gaps must be filled. The following developments will be crucial in the future to decide which custodian will enable institutional money to come. Insurance: worth mentioning that the current insurance market is still reluctant to cover Digital Assets, with only one major player doing so at a high cost. Tech: the need for sophisticated and secure applications/solutions is also paramount. Custodians need to implement the necessary banking grade technology and infrastructure to securely take custody of Digital Assets.